Please enter the church parking via the entrance on Spalding Drive. – Take GA-400 South to Exit 5 (Abernathy Rd./Sandy Springs), Make a right off of the exit. – Take a right onto Glenridge Dr. NE (your second traffic light). 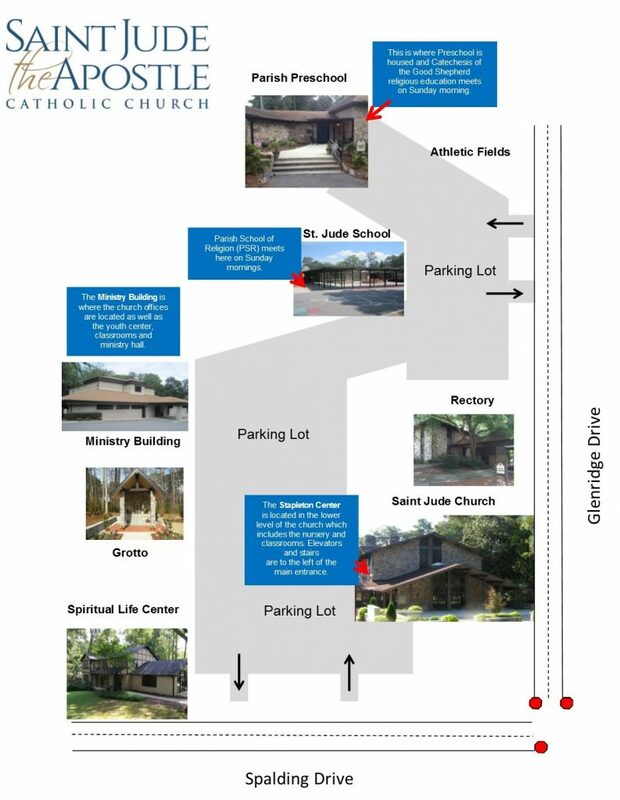 – Take the second street on your left (Glenridge Dr. turns into this road), you will see a wooden sign on the left hand side for St. Jude the Apostle. – Follow until the road dead ends, the church is on your right. – Take GA-400 North to Exit 5B, you will merge onto Abernathy Rd. heading towards the church. – Take a right on Glenridge Dr. NE (your third traffic light). – Follow Roswell Rd. south until Spalding Dr.
– Turn left left onto Spalding Dr.
– Follow Spalding for less than half a mile, you will come to a 3-way stop with Glenridge Dr.
– The church is on your right. Coming From the South on Roswell Rd. – Follow Roswell Rd. north until Spalding Dr.
– Turn right onto Spalding Dr.
– Take I-285 towards GA-400, follow directions from the South on GA-400.